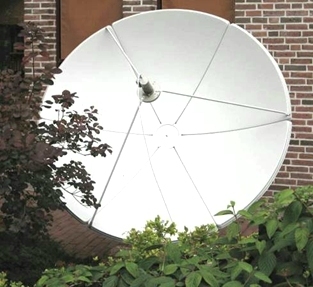 The C-Band antenna in the garden of the ITC building in Enschede, The Netherlands. In September 2009 a C-band GEONETCast reception configuration was installed at ITC. This antenna, with a diameter of 1.8 m., is pointing to Atlantic Bird, at 5 degree West. It is now possible at ITC to monitor the EUMETCast C-Band data dissemination scheme. Apart from the antenna, a C-band LNB and a Skystar-2 DVB board were used. The reception quality is good, even though the antenna dimension is smaller than proposed by EUMETSAT. For pointing use was made of a dish pointer utility (available at: http://www.dishpointer.com/). Take the GPS position of the antenna location and the utility will give you the angles needed to correctly point the antenna (to Atlantic Bird 3, situated at 5 degree west). For further information on the SkyStar-2 DVB board settings you can contact ITC (email: b.h.p.maathuis@utwente.nl or petra.budde@utwente.nl). For further information on the configuration of a Technotrend Budget S-1401 DVB card consult the "DevCoCast Reception Station Setup Guide Book" prepared by the Marine Remote Sensing Unit, University of Cape Town, or contact mark.matthews@uct.ac.za.